Learn the basic terms and concepts in AWS Key Management Service (AWS KMS) and how they work together to help protect your data. The primary resources in AWS KMS are customer master keys (CMKs). You can use a CMK to encrypt and decrypt up to 4 KB (4096 bytes) of data. Typically, you use CMKs to generate, encrypt, and decrypt the data keys that you use outside of AWS KMS to encrypt your data. This strategy is known as envelope encryption. CMKs are created in AWS KMS and never leave AWS KMS unencrypted. To use or manage your CMK, you access them through AWS KMS. This strategy differs from data keys. AWS KMS does not store, manage, or track your data keys. You must use them outside of AWS KMS. There are three types of CMKs in AWS accounts: customer managed CMKs, AWS managed CMKs, and AWS owned CMKs. AWS services that integrate with AWS KMS differ in their support for CMKs. Some services encrypt your data by default with an AWS owned CMK. Some encrypt under AWS managed CMKs that they create in your account. Other services allow you specify a customer managed CMK that you have created. And others support all types of CMKs to allow you the ease of an AWS owned CMK, the visibility of an AWS managed CMK, or the control of a customer managed CMK. Customer managed CMKs are CMKs in your AWS account that you create, own, and manage. You have full control over these CMKs, including establishing and maintaining their key policies, IAM policies, and grants, enabling and disabling them, rotating their cryptographic material, adding tags, creating aliases that refer to the CMK, and scheduling the CMKs for deletion. You can use your customer managed CMKs in cryptographic operations and audit their use in AWS CloudTrail logs. In addition, many AWS services that integrate with AWS KMS let you specify a customer managed CMK to protect the data that they store and manage for you. Customer managed CMKs incur a monthly fee and a fee for use in excess of the free tier. They are counted against the AWS KMS limits for your account. For details, see AWS Key Management Service Pricing and Limits. AWS managed CMKs are CMKs in your account that are created, managed, and used on your behalf by an AWS service that integrates with AWS KMS. You can identify AWS managed CMKs by their aliases, which have the format aws/service-name, such as aws/redshift. You can view the AWS managed CMKs in your account, view their key policies, and audit their use in AWS CloudTrail logs. However, you cannot manage these CMKs or change their permissions. And, you cannot use AWS managed CMKs in cryptographic operations directly; the service that creates them uses them on your behalf. To view the key policy for an AWS managed CMK, use the GetKeyPolicy operation. You cannot view the key policy in the AWS Management Console, or change it by any means. You do not pay a monthly fee for AWS managed CMKs. They can be subject to fees for use in excess of the free tier, but some AWS services cover these costs for you. For details, see the encryption section of the service documentation. AWS managed CMKs do not count against limits on the number of CMKs in each region of your account, but when they are used on behalf of a principal in your account, they count against request rate limits. For details, see AWS Key Management Service Pricing and Limits. AWS owned CMKs are not in your AWS account. They are part of a collection of CMKs that AWS owns and manages for use in multiple AWS accounts. AWS services can use AWS owned CMKs to protect your data. You cannot view, manage, or use AWS owned CMKs, or audit their use. However, you do not need to do any work or change any programs to protect the keys that encrypt your data. You are not charged a monthly fee or a usage fee for use of AWS owned CMKs and they do not count against AWS KMS limits for your account. You can use AWS KMS customer master keys (CMKs) to generate, encrypt, and decrypt data keys. However, AWS KMS does not store, manage, or track your data keys, or perform cryptographic operations with data keys. You must use and manage data keys outside of AWS KMS. To create a data key, call the GenerateDataKey operation. AWS KMS uses the CMK that you specify to generate a data key. The operation returns a plaintext copy of the data key and a copy of the data key encrypted under the CMK, as shown in the following image. AWS KMS also supports the GenerateDataKeyWithoutPlaintext operation, which returns only an encrypted data key. When you need to use the data key, ask AWS KMS to decrypt it. AWS KMS cannot use a data key to encrypt data, but you can use the data key outside of KMS, such as by using OpenSSL or a cryptographic library like the AWS Encryption SDK. After using the plaintext data key to encrypt data, remove it from memory as soon as possible. You can safely store the encrypted data key with the encrypted data so it is available to decrypt the data. To decrypt your data, pass the encrypted data key to the Decrypt operation. AWS KMS uses your CMK to decrypt the data key and then it returns the plaintext data key. Use the plaintext data key to decrypt your data and then remove the plaintext data key from memory as soon as possible. The following diagram shows how to use the Decrypt operation to decrypt an encrypted data key. When you encrypt your data, your data is protected, but you have to protect your encryption key. One strategy is to encrypt it. Envelope encryption is the practice of encrypting plaintext data with a data key, and then encrypting the data key under another key. You can even encrypt the data encryption key under another encryption key, and encrypt that encryption key under another encryption key. But, eventually, one key must remain in plaintext so you can decrypt the keys and your data. This top-level plaintext key encryption key is known as the master key. AWS KMS helps you to protect your master keys by storing and managing them securely. Master keys stored in AWS KMS, known as customer master keys (CMKs), never leave the AWS KMS FIPS validated hardware security modules unencrypted. To use an AWS KMS CMK, you must call AWS KMS. When you encrypt a data key, you don't have to worry about storing the encrypted data key, because the data key is inherently protected by encryption. You can safely store the encrypted data key alongside the encrypted data. Encryption operations can be time consuming, particularly when the data being encrypted are large objects. Instead of re-encrypting raw data multiple times with different keys, you can re-encrypt only the data keys that protect the raw data. In general, symmetric key algorithms are faster and produce smaller ciphertexts than public key algorithms, but public key algorithms provide inherent separation of roles and easier key management. Envelope encryption lets you combine the strengths of each strategy. 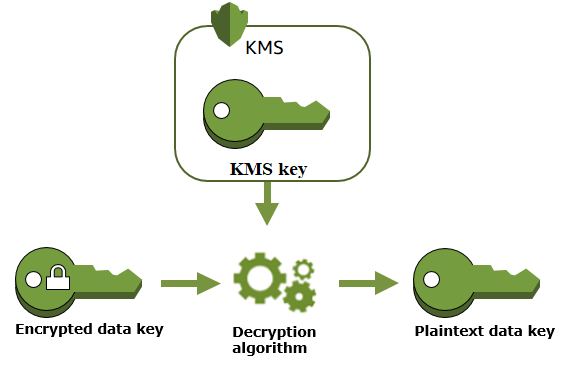 All AWS KMS cryptographic operations (the Encrypt, Decrypt, ReEncrypt, GenerateDataKey, and GenerateDataKeyWithoutPlaintext) accept an encryption context, an optional set of key–value pairs that can contain additional contextual information about the data. AWS KMS uses the encryption context as additional authenticated data (AAD) to support authenticated encryption. 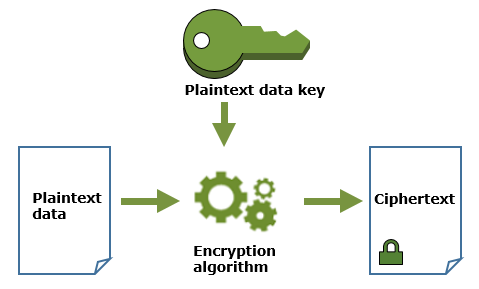 When an encryption context is provided in an encryption request, it is cryptographically bound to the ciphertext such that the same encryption context is required to decrypt (or decrypt and re-encrypt) the data. If the encryption context provided in the decryption request is not an exact, case-sensitive match, the decrypt request fails. Only the order of the encryption context pairs can vary. The encryption context is not secret. It appears in plaintext in AWS CloudTrail Logs so you can use it to identify and categorize your cryptographic operations. An encryption context can consist of any values that you want. However, because it is not secret and not encrypted, your encryption context should not include sensitive information. We recommend that your encryption context describe the data being encrypted or decrypted. For example, when you encrypt a file, you might use part of the file path as encryption context. For example, Amazon Simple Storage Service (Amazon S3) uses an encryption context in which the key is aws:s3:arn and the value is the S3 bucket path to the file that is being encrypted. You can also use the encryption context to refine or limit access to customer master keys (CMKs) in your account. You can use the encryption context as a constraint in grants and as a condition in policy statements. To learn how to use encryption context to protect the integrity of encrypted data, see the post How to Protect the Integrity of Your Encrypted Data by Using AWS Key Management Service and EncryptionContext on the AWS Security Blog. In addition to its primary use in verifying integrity and authenticity, you can also use the encryption context as a condition for authorizing use of customer master keys (CMKs) in IAM and key policies, and grants. This element can limit the permissions to very specific types of data or data from a limited set of sources. In key policies and IAM policies that control access to AWS KMS CMKs, you can include condition keys that limit the permission to requests that include particular encryption context keys or key-value pairs. When you create a grant, you can include grant constraints that allow access only when a request includes a particular encryption context or encryption context keys. For example, when an Amazon EBS volume is attached to an Amazon EC2 instance, a grant is created that allows only that instance to decrypt only that volume. This is accomplished by including the volume ID in the encryption context, then adding a grant constraint that requires an encryption context with that volume ID. If the grant did not include the encryption context constraint, the Amazon EC2 instance could decrypt any volume that was encrypted under the customer master key (CMK), rather than a specific volume. AWS KMS uses AWS CloudTrail to log the encryption context so you can determine which CMKs and data have been accessed. The log entry shows exactly which CMK was used to encrypt or decrypt specific data referenced by the encryption context in the log entry. Because the encryption context is logged, it must not contain sensitive information. To simplify use of any encryption context when you call the Decrypt (or ReEncrypt) API, you can store the encryption context alongside the encrypted data. We recommend that you store only enough of the encryption context to help you create the full encryption context when you need it for encryption or decryption. For example, if the encryption context is the fully qualified path to a file, store only part of that path with the encrypted file contents. Then, when you need the full encryption context, reconstruct it from the stored fragment. If someone tampers with the file, such as renaming it or moving it to a different location, the encryption context value changes and the decryption request fails. When you create a CMK, you determine who can use and manage that CMK. These permissions are contained in a document called the key policy. You can use the key policy to add, remove, or change permissions at any time for a customer managed CMK, but you cannot edit the key policy for an AWS managed CMK. For more information, see Authentication and Access Control for AWS KMS. A grant is another mechanism for providing permissions, an alternative to the key policy. You can use grants to give long-term access that allows AWS principals to use your customer managed CMKs. For more information, see Using Grants. A grant token is not a secret. The grant token contains information about who the grant is for and therefore who can use it to cause the grant's permissions to take effect more quickly. You can use AWS CloudTrail to audit key usage. CloudTrail creates log files that contain a history of AWS API calls and related events for your account. These log files include all AWS KMS API requests made with the AWS Management Console, AWS SDKs, and command line tools, as well as those made through integrated AWS services. You can use these log files to get information about when the CMK was used, the operation that was requested, the identity of the requester, the IP address that the request came from, and so on. For more information, see Logging AWS KMS API Calls with AWS CloudTrail and the AWS CloudTrail User Guide. A common practice in cryptography is to encrypt and decrypt with a publicly available and peer-reviewed algorithm such as AES (Advanced Encryption Standard) and a secret key. One of the main problems with cryptography is that it's very hard to keep a key secret. This is typically the job of a key management infrastructure (KMI). AWS KMS operates the KMI for you. AWS KMS creates and securely stores your master keys, called CMKs. 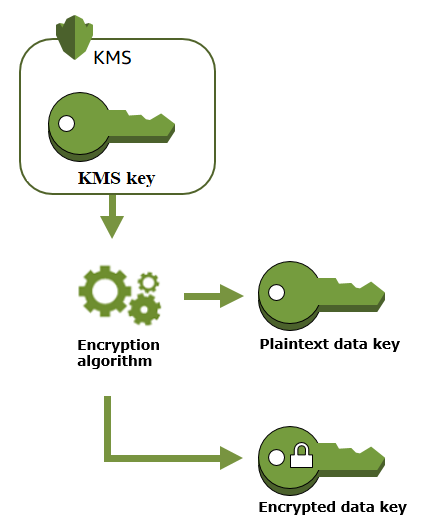 For more information about how AWS KMS operates, see the AWS Key Management Service Cryptographic Details whitepaper.